The name for God among the Gĩkũyũ is NGAI. Ngai seems from the many descriptions of him to be a man who related to the first man, Gĩkũyũ as a friend, walking with him and speaking with him. But Gĩkũyũ mythology suggests that he then retreats into the mountains and no longer communicates directry to humanity today. He however occasionally leaves his mountain abode and takes walks up and about viewing his creation. The Gĩkũyũ then say he is inspecting his wealth. (kũroora). One story states that the Karĩma Hill in Othaya, Nyeri is Ngai’s footprint as he moved between the Aberdares Range (Nyandarũa) to Mt. Kenya, (Kĩrĩnyaga) his main abode. When the Gĩkũyũ say, NGAI, NIWE MUGAI, (God is the only server), they mean literally that God, is the only source of all that they receive. Everything belongs to God and it is in God’s wisdom and benevolence that anything comes to them so his other name is MŨGAI which means the divider or distributer of spoils. Ngai wa Kirinyaga or Ngai of Mt. Kenya is the only God of the Gikuyu even if he may be referred to by other names. The white patch on Mt. Kenya resembles the white parch of the Ostrich, Nyaga and that is why He is called Mwene Nyaga or “Possessor of the white patch.” He is described by His qualities, as Possessor of Whiteness and showing that He is All-pure. When sacrificing a goat to him it must be without blemish or mark. This is why shoes are removed when approaching Him. Mũrungu in Gĩkũyũ means literally, “DWELLER OF THE UNDERWORLD”. In Gĩkũyũ mythology there dwells a people under the earth and they are the ones who gave the Gĩkũyũ fire. In this underworld which is somehow connected to the roots of the sacred fig tree, the Mũgumo dwells the spirits of the ancestors and God, MŨRUNGU, DWELLER OF THE UNDERWORLD” visits it occasionally. As already mentioned, Mũgai literary means THE DIVIDER, or THE ONE WHO SERVES, or giver of all; therefore possessor of all. According to Gĩkũyũ mythology, the first man Gĩkũyũ walked with God. God then took him to the top of Mt Kenya and there showed him all the land of the Gĩkũyũ. He then directed the man to a grove of trees near present day Muranga and told him to go and establish his homestead there. 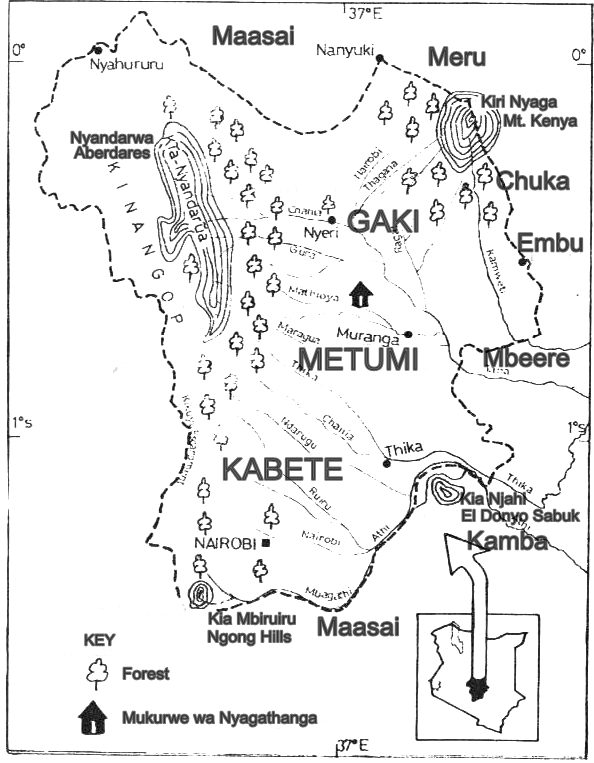 This is the Gĩkũyũ sacred site of origin, Mũkũrwe wa Nyagathanga. On arrival he met a woman, Mũmbi the two became man and wife. (Full Story). Gĩkũyũ and Mũmbi then were with this Ngai at the beginning of Gĩkũyũ time. It is not clear from the available Gĩkũyũ creation myths how the earth and everything else was created prior to that. What we do know is that Mũmbi the woman’s name means, CREATOR or POTTER. Whether the woman had a hand in creation or she merely made pots is also not clear. Since the man Gĩkũyũ, found her already waiting for him at the sacred grove Mũkũrwe wa Nyagathanga, she may have pre-existed in the form of the earth itself. NGAI WA GĨKŨYŨ NA MŨMBI or God of Gĩkũyũ and Mũmbi is this God in Gĩkũyũ mythology. These are the traditional names for God in Gĩkũyũ and any other names, eg. MWATHANI – Lord, MWENE HINYA WOTHE – God almighty, MŨTŨŨRA MWOYO – Eternal God, MŨTEITHĨRĨRIA – Helper, etc. etc. may have been later derivations from Christianity. The word NGOMA meaning SPIRIT or SPIRITS is not to be confused with NGAI, God. Spirits dwell among men and seem to be the connection between the living and the dead. The Gĩkũyũ believe that peaceful dead live in the realm of MŨRUNGU, the underworld. The act of pouring a ritual libation to the ancestors before partaking a drink is meant to connect one with the ancestors. The evil spirits of those departed who have never rested in peace however roam the earth and are the source of mischief and misfortune. Mũrathi in Gĩkũyũ literally means PROPHET or SEER. This was a man who Ngai chose as his messenger to the rest of the people. A famous Seer of the Gĩkũyũ was Mũgo wa Kĩbirũ who foresaw the coming of the White man into Gĩkũyũ country some 200 year ago. NGAI NDATANGATANGAGWO – GOD MUST NOT TO BE DISTURBED NEEDLESSLY. Ngai, is distant and is not involved in the affairs of men here on earth though he visits them from time to time. He is not to be disturbed with petty annoyances which can be sorted out by the intervention of benevolent spirits. He is beseeched upon on certain occasions when everything else has failed. This is never an individual experience but a community affair when sacrifices are made for instance over a prolonged drought or famine. A personal relationship with Ngai was unheard of except for the first man Gĩkũyũ . 1. 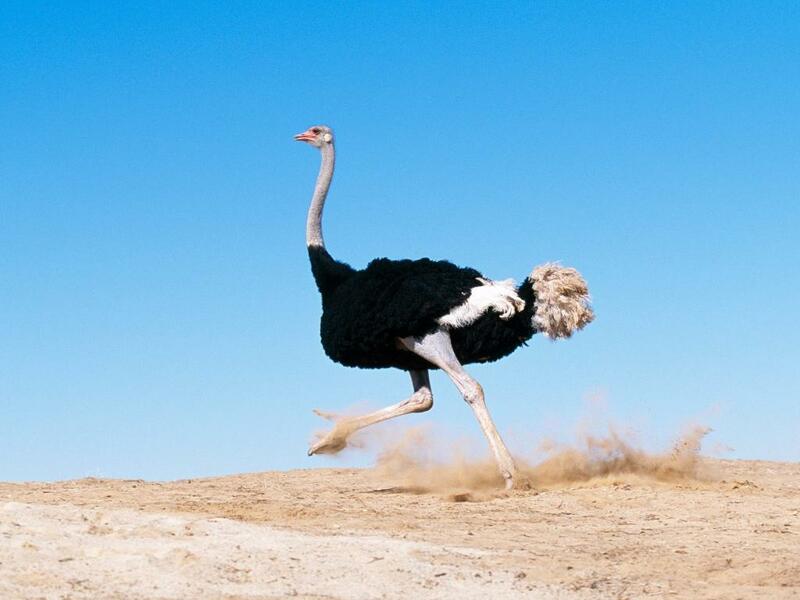 Nyaga: This has 2 meanings in Kikuyu – the ostrich and excellency (riri). Kamaru sings, “nyaga yakwa yaunangirwo ní kamúndú ndomba múka” etc. meaning mwene riri or exellency. 2. Múrungu. The other meaning of this in Kikuyu is, “animal without horns”, meaning harmless. A Kikuyu proverb says, “ona í múrungu ní yúragaga nyúngú” – meaning be careful those who seem calm may be dangerous if provoked. I came across this blog when researching on our own native philosophy and understanding of the Underworld/Hades as well as our Gīkūyū conception of the Prometheus myth. I knew we use mūrungu for god, but also that it must have to do with the Underworld. It’s very interesting to see that indeed we have similarities in our lore with other mythologies; Mūrungu giving Gīkūyū Fire=Prometheus stealing Fire from heaven to give to humans…..Mūrungu being of the Underworld=Hades/Pluto being the god of the Underworld…etc. Meanwhile, I have a question; do you have anything pertaining to our lore on dreams(dreamwork)…as dreams have been spoken of as connected with the Underworld in many traditional lore? 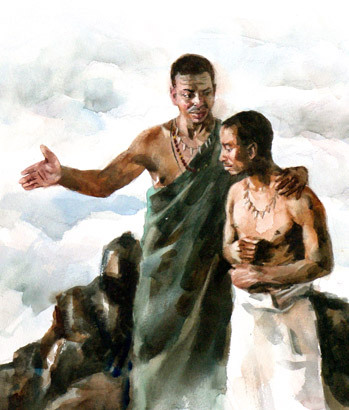 The Fire/Prometheus myth is told in the Gikuyu tale “How fire came into the world”, a tale that involves a man going into the underworld and returning with it. I think Fred K. Kago has a version of it in his Kikuyu Primer 3. I don’t seem to have anything on dreams. Thank you for your comments. Facing Mt. Kenya is the only one still on print. We have yet to republish any of the rest but you can get PDF copies from us. How do you rate Facing Mt. Kenya? From what accounts do you determine that God was thought of as a man? Actually there is no evidence that God, Mwene Nyaga is a man but just like the Hebrew myth the telling betrays the thinking behind it – that He is a man. Thank you for your response, the tendency to use pronouns when describing people as is done in the English language is a new phenomenon in kikuyu consciousness making me worry that when we assign a gender to who we consider the most high we taint our understanding of God. And in the process invite the ills of patriarchy into our thinking eventually influencing our way of life. Finding out recently that Ngai means divider adds such a richness and depth into the name God, I am forever grateful. I also find it interesting that creator is often used in the English to describe God while in our language divider and creator are two distinct ideas. In the process of learning about my culture am also learning about the Yoruba belief system that is wonderfully adding onto my understanding about spirituality. Would you say that the kikuyu were very spiritual people? Hi. Gīkūyū culture and tradition did not assign any gender to Ngai. Remember how we use ‘he’, ‘her’ and ‘it’ in English? Well, Gīkūyū culture and tradition goes a little further. Gīkūyū language does not have the above English equivalents but refers to God in a special category beyond we humans. An instance of the gender-less reference to God is in the example in the above narrative but correct it to its proper form, “Ngai ndĩtangatangagwo” or “Ngai ĩroigwa tha”. Numerous old enough Gīkūyū men and women while discussing pertinent issues regarding God use that equivalent of the third-person singular NEUTER/NEUTRAL “it” pronoun. That is the proper neutral pronoun reference of God in Gīkūyū culture and tradition. Thank you. Although this does not indicate that the Gikuyu believed God was a Man, He is referred to as Awa, a name which depicts Father in Gikuyu…… and therefore a father. Though I might not have facts right women did not own property in Gikuyu tradition. 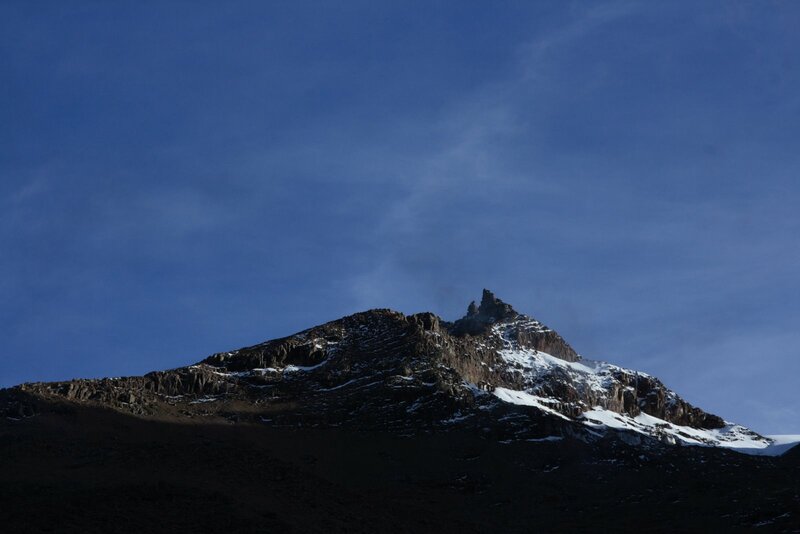 With that in mind, Mwene Nyaga indicates that Ngai, (Awa) is the one who owned Nyaga because Nyaga’s neck and head reflect the glacier and snow on top of Kirima Kiri Nyaga.